There was a lot of speculation and whispered voices at church this morning. We were told two weeks ago that our two wards/congregations (South Bend & Mishawaka) were being split into three. Mickey and, by association, I have been asked many questions over the last two weeks about what was going to happen. We were under orders not to talk (and we didn't know all the details). So we didn't, much to people's dismay. So here's what happened. Mishawaka ward gave up some of its members. South Bend ward gave up its name as well as some people to add to the afore mentioned members to make the "new" South Bend ward. Are you following so far? Then the original South Bend ward became the Norte Dame ward. The bishopric from the original SB ward went to the ND ward so Mickey still has his calling as second counselor. I know totally confusing. Maybe this will clear it up. Here's the map. Since I don't have anything positive to say, and I've already spoken more than my fair share of negative, I'm not left with much to talk about. We'll see how it goes. I think that's all I can say. Later today Mickey asked Kade what he thought about going to the Notre Dame ward. He replied, "The Notre Dame ward rocks!" At least one of us is excited about the changes. Oh, wait. One good thing, we have the 9:00 a.m. time slot. 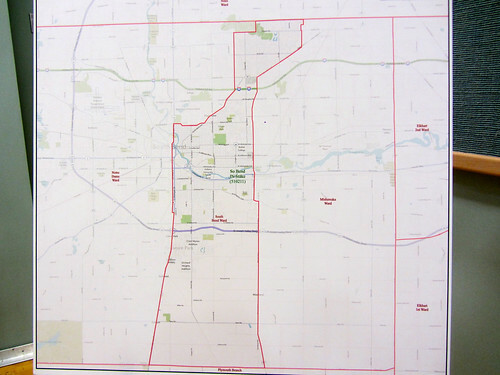 I can't really tell from the pictures which neighborhoods exactly were sent to the South Bend ward. Who isn't in the ward anymore? It looks from the map like Notre Dame isn't even in the Notre Dame ward. An it looks like Granger is in the Mishawaka ward...How are you guys in the Notre Dame ward? Am I looking at it wrong? The line dividing SB & ND from the north heading west goes down Gumwood to Adams to Hickory to 23 to Edison/Anglea to 31 (or 933 as it's called now). ND campus is just north of the line so it barely made the cut. We got pulled into the ND ward because the bishopric needed to go to the "new" ward. Our old house is in the SB ward. Our new house is by the previous bishop's house. Does that answer your questions? Wow! We're about to have the two wards that meet in our building turned into three. It will be interesting to see how they create three wards. I'm really excited about the changes really. Our ward is very spread out, so I'm hoping it makes our ward closer. We'll see what happens. We've been hearing about the split since August, so who knows when it will happen!